Do you live in Ontario and have at least 2 or more children between the ages of 7 - 16? Are you scared to let your children cross the street or play in the front yard because they might get injured? 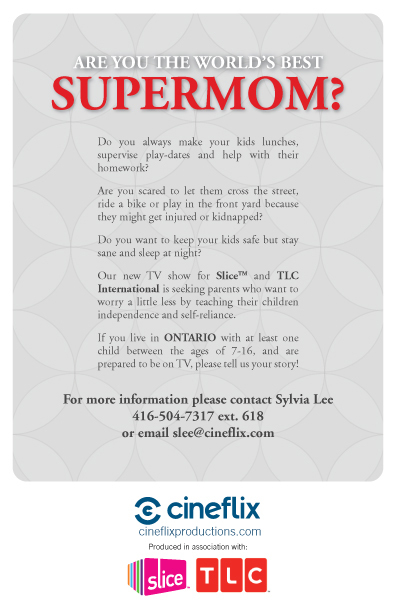 If you are the type to worry about your children and want to learn how to worry less by teaching them independence and self-reliance, then share your story for a chance to be cast on a new TV show for Slice and TLC International. You can contact Sylvia Lee at 416-504-7317 ext. 618 or email her at slee@cineflix.com. Interested applicants can fill out this online survey today.